Gruesome, bizarre, and excruciatingly meticulous in technique, Salvador Dalí’s paintings rank among the most compelling portrayals of the unconscious mind. In this work, the artist turned his attention to the impending Spanish Civil War, which began in July 1936 and would turn his native country into a bloody battleground. Dalí described this convulsively arresting picture as “a vast human body breaking out into monstrous excrescences of arms and legs tearing at one another in a delirium of autostrangulation.” The desecration of the human body was a great preoccupation of the Surrealists in general, and of Dalí in particular. Here, the figure’s ecstatic grimace, taut neck muscles, and petrifying fingers and toes create a vision of disgusting fascination. Salvador Dalí developed his "achingly precise version of Surrealism to achieve what he called a concrete irrationality." This, he hoped, would lend credibility to images of the unconscious, which in turn would discred the world of reality. In Soft Construction with Boiled Beans, however, Dalí applies his method to the very real and deeply troubling subject of the Spanish Civil War of 1936-39. Here a vast, grotesque body rips itself apart, its grimace registering the pain. Set against a technicolor sky and the parched landscape of northern Spain, the mutating figure dominates its environment. This disjunction of scale indicates its symbolic function--despite its hysterical concreteness--as a representation of the physical and emotional self-conflict in which Spain was both the victim and the agressor. The little professor, wandering across the landscape at left, adds an odd counterpoint to the frenzied mass of flesh, as do the morsels of boiled beans that may refer to the ancient Catalan offering to appease the gods. John B. Ravenal, from Philadelphia Museum of Art: Handbook of the Collections (1995), p. 323. With its flair for detail as gruesome as it is meticulous, Salvador Dalí's Surrealist style might well have been invented for the depiction of the unique horrors of the 1930s and 1940s in Europe. This painting, however, is one of only a few in which Dalí turned his attention to the political moment. Like the mural-sized painting Guernica by Pablo Picasso, painted one year later, it cries out against the Spanish Civil War begun by Francisco Franco's nationalist insurrection against the democratic government of the Spanish republic. Over the decades, both Soft Construction and Guernica have come to serve as universal icons decrying human hatred and destruction. 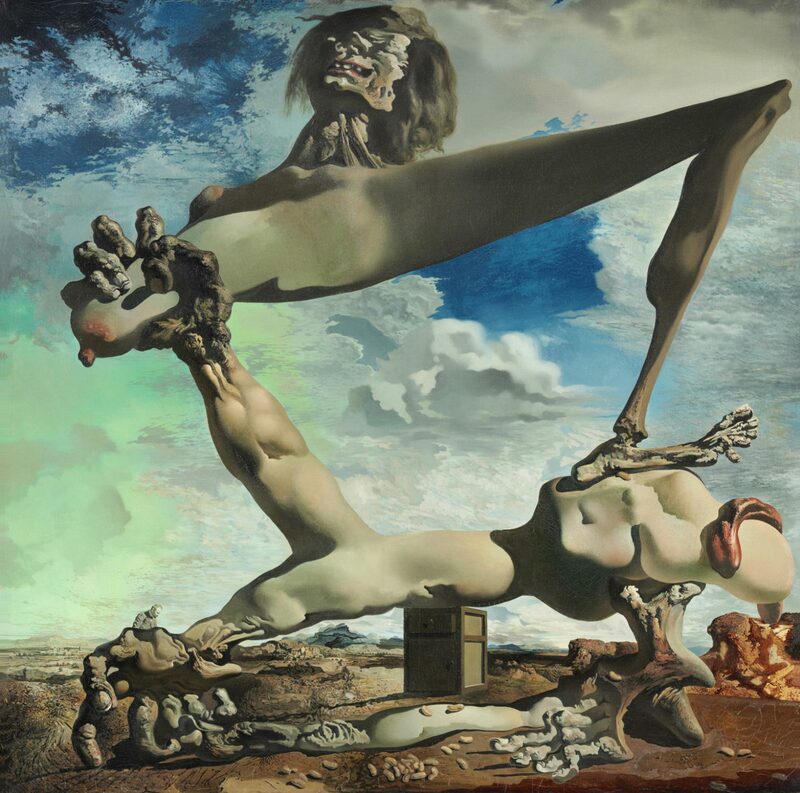 Dalí's own words, as singular as his pictorial language, best describe the mood of this overwrought picture: "a vast human body breaking out into monstrous excrescences of arms and legs tearing at one another in a delirium of autostrangulation. "1 Dalí's fellow Surrealists reveled in the desecration of the human body, whether in painting, sculpture, or photography, but none had yet descended to such depths of tortuous anatomy. The ecstatic grimace, the taut neck muscles, the elasticized torso, and the petrifying fingers and toes all conspire to create a vision of disgusting fascination. So persuasive is the construction's awful presence that it appears to be an authentic natural phenomenon, an eighth wonder of the world, rather than merely a human figure or an imagined apparition. With the limp phallic form draped over the truncated hip, Dalí deployed his signature device of "soft" form, and the scattered beans of the title exemplify the bizarre incongruities of scale he used to conjure the workings of the unconscious mind. Dalí saluted Sigmund Freud, whose work inspired him to embrace his nightmarish visions, with a tiny portrait inspecting the curling hand at the lower left. Twentieth Century Painting and Sculpture in the Philadelphia Museum of Art (2000), p. 76. 1) Salvador Dalí, The Secret Life of Salvador Dalí, translated by Haakon M. Chevalier (New York: Dial Press, 1942), p. 357. With Julien Levy Gallery, New York, by 1937 (on consignment from Peter Watson?) ; purchased from the artist by Stendahl Art Galleries, Los Angeles, November 4, 1937 ; sold to Louise and Walter C. Arensberg, Los Angeles, 1937; gift to PMA, 1950. 1. See 1937 exhibition loan label on reverse of painting. 2. Stendahl purchased the painting out of the Carnegie International exhibition (see Stendahl Gallery records, Archives of American Art, microfilm reel #2722, frame 130). See also the Arensbergs' provenance notes dated December 1, 1951 (PMA, Arensberg Archives).